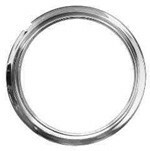 Factory style chrome round bezel that goes around each gauge cluster. 2 required. This is the vertical brace that mounts to the inside where the windshield meets in the center. High quality reproduction of the "Chevrolet" Center Dash Speaker Grille. Features original "Chevrolet" lettering with built in ash tray. Replace your entire dash face with this new high quality factory reproduction from USA1 Industries. High quality reproduction of the "GMC" Center Dash Grille. Features orginal "GMC" lettering with built in ash tray. Factory style "chrome" round bezel that goes around each gauge cluster. Fits Chevy Only. Factory style "stainless" round bezel that goes around each gauge cluster. Fits Chevy Only. This is the plastic garnish molding that attaches inside the cab at the bottom of the windshield to finish out your dash! Restore the shine of your Chevy Trucks dash with a new Chrome Dash Instrument Bezel from USA1 Industries. See clearer with a new quality reproduction dash lens from USA1 Industries.